Prep cookie sheet with parchment paper. Put EVOO and spices (cumin, coriander, cayenne) in a large bowl and whisk well. Add chopped butternut squash (any squash would work). Place squash flat on cookie sheet. Bake for 30 minutes. After halfway turn the squash to change the side that is on the cookie sheet. I did this by pulling cookie sheet out of oven and taking the edges of the parchment paper and sort of jostling them around. This really worked great to mix up their positions. Put back in oven for remaining 15 minutes. WATCH close after 20 minutes. You don’t want to burn these! They should get “crispy” but also soft through. While it cooks, roast your pine nuts on the lower shelf in oven for 10 minutes. Also shake these around to evenly distribute their “baked” side. Mmmmmm…YUM. Prep your two plates with rinsed and patted dry spinach. I use my salad spinner. Spinach can be super dirty (especially the organic type) with actual dirt and that makes gritty bites. Bleh. I rinse well. I left the tips on because I like the stems. Your choice. Warm up your quinoa (you should make a big batch to pull from all week). If none made, it takes 15 minutes or whatever your instructions are. Follow them for perfect quinoa. 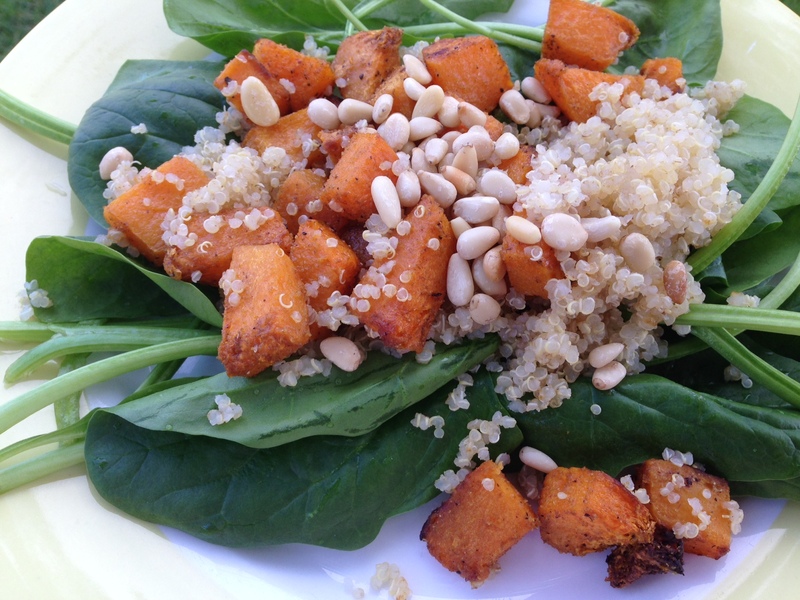 Once roasting squash is done mix it LIGHTLY with your quinoa. Place on top of spinach. Then divide the pine nuts and toss them on top. I put a teaspoon of Neumann’s Own EVOO salad dressing on my spinach to jazz it up. Randy ate his with a lot of red pepper flakes. Salt and pepper TO TASTE means you do it right before serving. Don’t kill the recipe with too much salt.